The final entry deadline for the 2013 (7th annual) Stevie® Awards for Sales & Customer Service, the world's top business awards for contact center, customer service, business development, and sales professionals, is quickly approaching on January 15. You can begin your submission process by requesting your entry kit here. The entry kit contains all of the instructions you need about how to prepare and submit your entries. The Stevie Awards for Sales & Customer Service feature more than 125 sales awards, customer service awards, and call center awards categories honoring sales excellence and best customer service practices for individuals, teams, and departments, plus categories this year for products and service and solution providers. The 2013 awards will recognize achievements since July 1, 2011. Select your categories, write your submissions according to the instructions, and submit your entries. All entries are submitted online. You can begin by registering here. Winners of the 2013 edition will be announced at an awards banquet at Paris Hotel, Las Vegas, Nevada, USA, on February 25, 2013. Don't hesitate to contact us with any questions regarding the 2013 Stevie Awards for Sales & Customer Service. Email us at help@stevieawards.com or call us at + 1 703-547-8389 and we'll get back to you right away. Becky McKinnell, President and Founder of iBec Creative in Portland, Maine, USA, was named Best Young Entrepreneur in the 8th Annual Stevie® Awards for Women in Business. (Entries for the 2013 Stevie Awards for Women in Business, the world's top honors for female entrepreneurs, executives and the organizations they run, will open in May. Join our mailing list and the entry kit for the 2013 awards will be emailed to you when entries open.) Let’s take a look at what motivates McKinnell. Becky McKinnell describes her company, iBec Creative, as an innovator in intuitive marketing and design, combining functional technology and artistry, and drawing on a mix of traditional and emerging media. 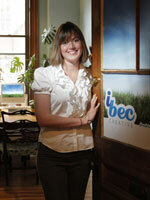 At just 27 years old, Becky McKinnell has taken iBec Creative through a tremendous period of growth. She started the company in 2006 when she recognized the need for a fresh approach to website and traditional design services in southern Maine. At first a solo operation, iBec has now expanded to 15 employees and 260 active clients from around the country, 71 of those clients added in the past two years. iBec Creative has become a leader in Maine for its Mobile Web technology and recently launched a new affordable intranet platform solution. The company celebrated its 6th anniversary in May 2012. And as an ongoing part of the USM Think Campaign to strengthen the state of Maine. Becky also donates time and services from her business to various non-profits, and contributed some 2000 hours in pro bono work over the past year. Becky was recognized in 2011 for her success as a Maine business leader and young entrepreneur with an Entreverge Award from the Portland Chamber of Commerce. This award recognizes area entrepreneurs for their innovation and contribution to the Maine business community. She also received a “Top 40 Under 40” award that recognizes Maine’s emerging stars under 40 years old for their commitment to leadership, professional excellence, and their communities. iBec Creative has received recognition for its work in web design with finalist titles for three award categories in the 2011 TechMaine awards. Becky McKinnell, President of iBec Creative, located in Portland, Maine, is known as a leader of the next generation of Internet marketers. She was recently named by BusinessWeek as one of the country's “Top 25 Entrepreneurs 25 and Under”, and as the SBA's “Young Entrepreneur of the Year” in Maine. Formally trained in the arts and entrepreneurial studies, Becky brings a technically savvy and fresh sense to marketing design and the application of multi-media. Becky graduated from University of Southern Maine with a Bachelor’s Degree in Art and Entrepreneurial Studies. She currently serves as Vice President of the Board of Directors for Port Resources. iBec Creative is a leading provider of website and traditional design services based in Portland, Maine. iBec Creative brings fresh ideas and an intuitive understanding of technology to its work of creating appealing websites and building online marketing campaigns. It is an enthusiastic partner with clients in creating branding and marketing solutions. If you can't make today's deadline the final deadline is March 27, and late entries will be accepted through April 24 with payment of a late fee. You can find all entry details online, at www.StevieAwards.com/ABA. If you have questions regarding the submission process, we have several resources including past winners' entries for your review, and 7 tips on submitting winning entries to help you make the most out of your entries. Need last minute help? Don't hesitate to contact us with your questions about how to participate in The 2013 American Business Awards. The second early-bird entry deadline for The 2013 American Business Awards, the premier business awards competition in the U.S.A., is tomorrow, December 12. Entry fees are discounted by as much as 15% for entries submitted through December 12, download your entry kit today. If you miss this early-bird deadline, the final deadline is March 27, and late entries will be accepted through April 24 with payment of a late fee. You can find all entry details online, at www.StevieAwards.com/ABA. Nominations should cite achievements during our eligibility period: January 2012 through April 24, 2013, the last day that late entries will be accepted. There is no eligibility timeframe for web site entries - it does not matter when the web sites were first published. Have last minute questions? Don't hesitate to contact us with your questions about how to participate in The 2013 American Business Awards. The American Business Awards honor organizations and individuals in a wide variety of categories, types of business awards categories include: app awards, company / organization awards, customer service awards, HR awards, IT awards, management awards, marketing awards, new product awards, PR awards, and website awards. See the full list of business award categories. If you can't make the December 12, 2012 early-bird entry deadline, March 27, 2013 is the next entry deadline and April 24, 2013 is the last day that late entries will be accepted with payment of a late fee. Finalists will be announced on May 8, 2013. All entry details are available online, at www.StevieAwards.com/ABA. To help you make the most out of your entries, we suggest reviewing our past winners' entries for tips and guidance, and reading our 7 tips on submitting winning entries. Have questions? Don't hesitate to contact us with your questions about how to participate in The 2013 American Business Awards. Don't worry if you can't make next week's second early-bird deadline, March 27, 2013 is the entry deadline and April 24, 2013 is the last day that late entries will be accepted with payment of a late fee. Two helpful resources to make your submission process easier include the publication of past winners' entries for your review and 7 tips on submitting winning entries to help you make the most out of your entries.